De La Paz, S., Hernández-Ramos, P. & Barron, L. (2004). Multimedia Environments in Mathematics Teacher Education: Preparing Regular and Special Educators for Inclusive Classrooms. 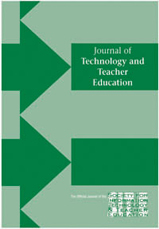 Journal of Technology and Teacher Education, 12 (4), 561-575. Norfolk, VA: Society for Information Technology & Teacher Education. Retrieved April 24, 2019 from https://www.learntechlib.org/primary/p/4283/.